We're getting a bit used to Rafa getting 10 wins at a single tournament. This title was only his 5th in Madrid. That's still more here than all but a rare few achieve in their entire career across all ATP Masters 1000 tournaments. I was lucky enough to be there for the week so this is a personal view of proceedings. When we saw him practise one of our number, who is no stranger to ear infections, knew straight away that he had a problem. It was a relief, therefore, to hear that he reckoned it was getting better every day. Still didn't stop me getting nervous before his first match. Fabio Fognini is an awkward player. Rafa would probably describe him as a "tricky opponent". My view is that if he had half of Rafa's work ethic he'd be one of the greats. As it is, you never quite know which Fabio will turn up to play. 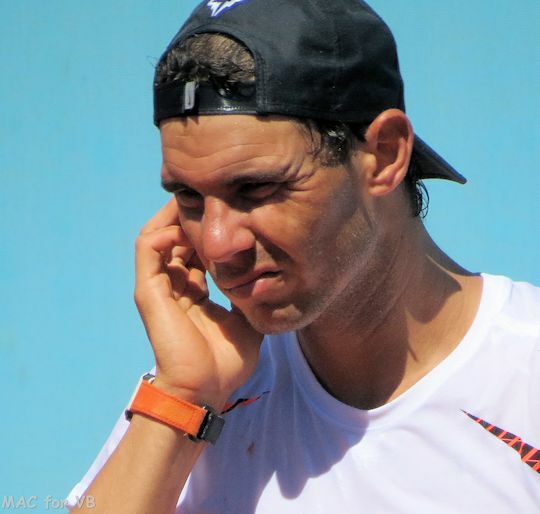 Whether it was due to his ear or not we'll never know, but Rafa started off playing badly . All Fognini needed to do was keep the ball in play to get a point. How Rafa won that first set against the odds I will never know. It's what champions do, I guess. The second set was more of the same but this time Fognini won it. The third set could have been the same but near the end it did seem that Rafa upped a gear like he'd thought "sod this for a game of tinnies, let's get this over". But then it all went a bit pear-shaped for that game when he was serving for the match. So glad he turned it around again in the next game. We weren't looking forward to another tiebreak. It was finally over, 7-6(3), 3-6, 6-4. Rafa's celebratory roar was wonderful. Next up was Nick Kyrgios. Watching Kyrgios is torture. He tries to serve at double quick speed (the commentators must love him) but Rafa was having none of it and forced him to play at his pace. He moves into court before Rafa has hit his serve which worked once or twice but largely failed. So glad that Rafa just ignored all this and just got on with things. He won, 6-3, 6-1. Still, if ever there was a time for Rafa to face him, then this was it. Rafa came out with all guns blazing and took the first set before Djokovic knew what hit him. The second set was more competitive and the last game, especially, a lot tighter. If Djokovic had won it things might have turned out differently but Rafa dug in, saved the break points and came out the winner, 6-2, 6-4. And so we got another final. For the second tournament in a row it was Dominic Thiem across the net. I'd been less concerned about this match than I had been about the semi final - rookie mistake. The first set was torture. Both players were tight and nervous though I think Rafa played marginally better, despite some woeful errors. The tiebreak was horrible. I am very proud of myself for not hiding behind my t-shirt once. There was a group sigh of relief when Rafa managed to take it. The early break in the second set was a relief but what turned out to be the last game of the match was a real nail-biter. I still felt Rafa would win even if he'd lost that game and subsequently the set but I was hugely glad that it didn't come to that when Rafa took his 4th match point to win, 7-6(8), 6-4. So that's 30 ATP Masters 1000 titles (equaling the record), 52 on clay and 72 titles overall.